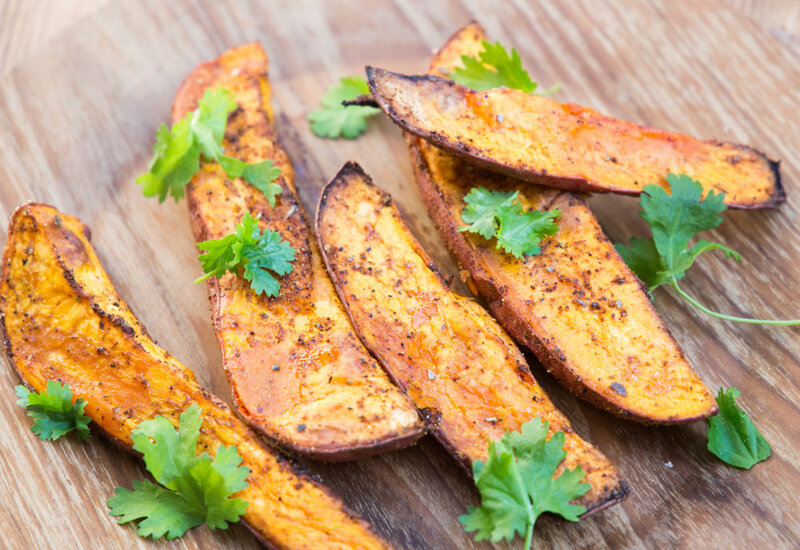 Chili powder, garlic powder, salt, paprika, and oregano come together to season these Southwestern-inspired sweet potato wedges. Cooked in the air fryer, these wedges are crispy on the outside and tender on the inside and ready in 30 minutes, much less time than if cooked in the oven! Serve these up for a happy hour appetizer or alongside your favorite burger and refreshing beverage. Try other seasonings! Keep it simple with just salt and pepper. Add cumin and cayenne for an earthy and spicy flavor. The options are endless! Per Serving: 119 calories; 7g fat; 13.8g carbohydrates; 1g protein; 0mg cholesterol; 290mg sodium. Simple recipe, great flavors, and perfect for my Whole 30 regiment. Loving my air fryer so far! It cooks the potatoes nice and even. Made this recipe to go with some pulled pork sandwiches and they were amazing. Few ingredients and easy instructions made it even better.